without having any trade skills whatsoever. Program We Have Ever Created. Everything you thought you knew about making money in real estate has changed. Right now, at this very moment, real estate is transitioning into a new phase. Because the $40k Flips System works in any market, at any time, in any economic climate, and it never changes. $40k Flips has been working for the past 40 years….it’s been working for me for the past 9 years….. it’s been working for my platinum coaching clients for the past 7 years (since I started my coaching program) and IT WILL WORK FOR YOU TOO. I guarantee It! See My No Risk, No Fail 100% Guarantee at the Bottom of this page! Look at these VERY recent deals we’ve closed! 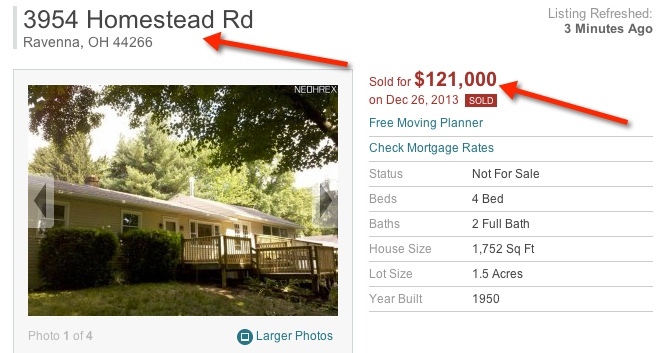 1473 Lakewood Ave we bought for $40,000 and we’re flipping for $180,000…a $40k Flip. 5309 Lindford Ave in Canton Ohio we acquired as a bank owned house for just $55,000 and just 43 cents on the dollar and we’ve sold for $153,000…a $50,000 Flip! 5636 Fairland Ave we bought from www.auction.com for $27,000 and we’ll sell for $119,000…a $40k Flip. 1297 Steve Dr that we acquired for $50,000 and SOLD on Jan 7th 2014 for a $38,000 PROFIT. 907 School drive we just bought for $54,000 using none of own cash or credit and will flip for $139,900 a $40k Flip. 2312 Iota Drive we bought for $53,000 and Sold on January 7th 2014 or $139,900….A $38,000 Profit Flip. money. We SOLD this one on for $124,900. A $32k FLIP!!! 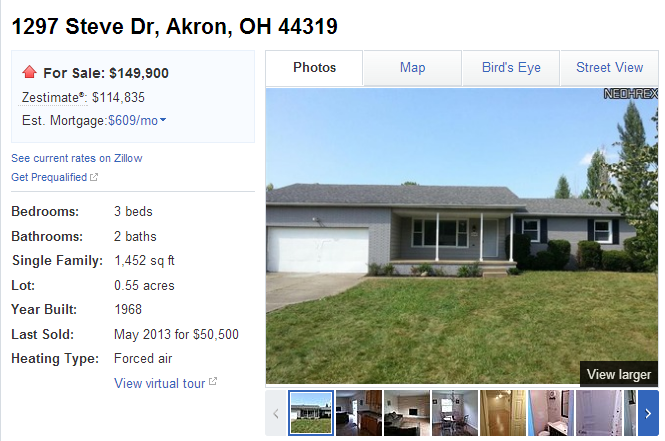 2713 Massillon Rd we bought for $54,299 and Sold for $137,000 ...a $36,000 Profit. 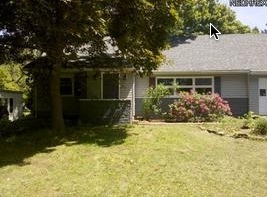 951 Wall Drive we bought for $54,299 and will flip for $139,900 and a $41,000 Profit. 2179 Pamer we acquired for $46,500 and are selling for $139,900….a $44k Flip! 1355 Keystone we acquired for $43,000 and will renovate and flip for $145,000 for a $38,000 profit. 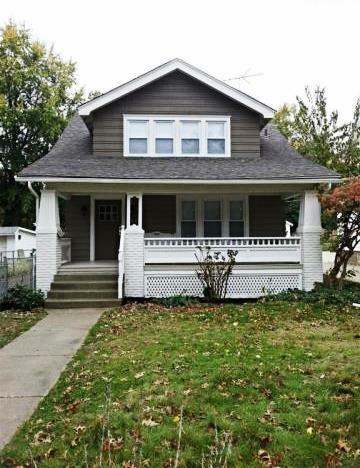 770 Dunbar Ave we just bought for $51,400 and we’re flipping for $144,900…...a $43,000 profit flip. 1171 Gardner Rd. 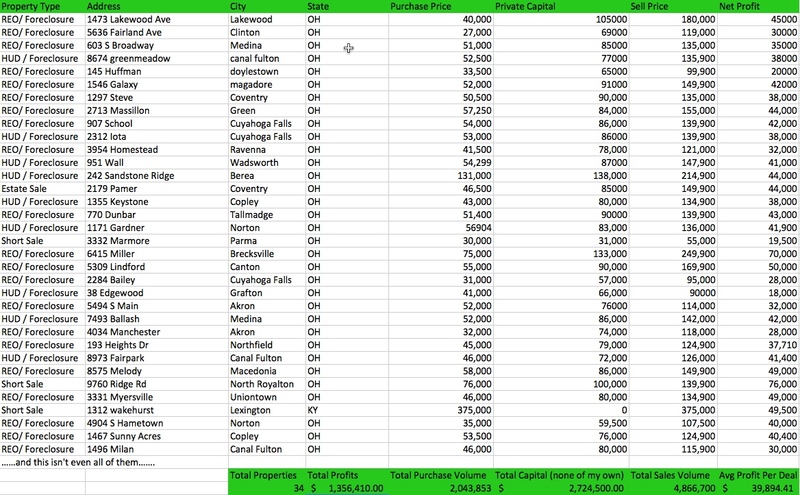 we purchased with none of our own money for $56,904 and we SOLD on August 11th 2013 for $136,000. A $41,490 FLIP!! 2284 Bailey Rd. we bought for $31,000 and SOLD on September 9th 2013 for $95,000. A $28,000 FLIP!!! 5494 Main St. was once worth over $150,000. We just bought it for $52,000 with none of our own money and we sold for $114,000 in July 2013. A $32k FLIP!!! 38 Edgewood Dr we are buying for $41,000 and sold for $90,000 . A $18k FLIP!!!! 7493 Ballash Rd Sold for $139,000 in January 2000. I just bought it for $52,000 with none of our own money and sold it in JULY 2013 for $142,000. a $40k FLIP!!!! 193 Heights Dr. was once appraised for $155,000. We just bought it for $45,000 with none of our own money and sold it for $124,900 in March 2013 A $37,710 Flip!!!!! 3332 Marmore once sold for $75,000. I bought for $30,000, with none of our own money, did practically nothing to it and sold for $55,000. A $19,500 FLIP!!! 8973 Fairpark Ave we bought for $46,000 with none of our own money and sold for$126,000 in April 2013. A $40k FLIP!!! 8575 Melody Lane we bought for $58,000 with none of our own money and sold for full asking price (in 90 minutes no less) of $149,900 in May 2013. A $49k FLIP!!! I bought 9760 Ridge Rd with none of my own money for $76,000 and sold for $139,900 in June 2013. A $40k FLIP!!! 3331 Myersville rd we bought for $46,000 and sold it for $134,900. A $49,000 FLIP!!! 4904 S Hametown Rd I bought for $35,000 and sold for $107,500. A $40k FLIP!!! 1467 Sunny acres once was worth over $151,000. We bought it for $53,500 with none of our own money and then re-sold it for $124,900, making over $40,400 net profit after all expenses. A $40k FLIP!!! Plus dozens more… IN THE PAST 12 MONTHS!!!!!!! Real estate opportunities are popping up at ALARMING rates… and investors like me have been making a financial killing as a result. So what EXACTLY am I offering you? How can you get started improving your financial life today doing $40k Flips? My Brother Mark and I Have Decided To Team Up To Teach Our Little Known, Best Kept Secrets That Reveal How To Make A Monsoon Of Money Flipping Distressed Homes for $40,000 a pop. Every Secret And Every Step Of The $40k Flips System. 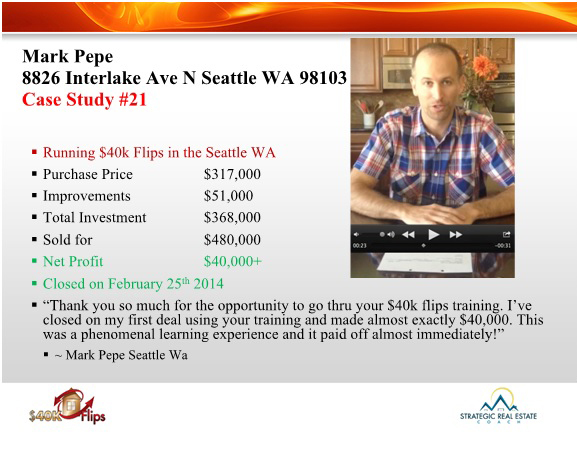 Want More Proof That $40k Flips Is A Game Changer For You & The People You Care About? Here’s what we will cover when you join us in The $40k Flips 7 Week Live Coaching Program. This class is set up to show you exactly how to profit from $40k flips.I will walk you thru the entire 7 week training and coaching program, walk you thru the classes, curriculum and members site and get you ready to blast off using the best real estate coaching program ever created. Right off the bat, we’ll hit you in the nose with the ONE BIG SECRET... You’ll discover how you can generate at least $40,000 profit on each rehab without EVER swinging a hammer or using any of your own money. You’ll discover how to AUTOMATE this process so that it runs with minimal involvement, allowing you to live your life as you please while the flips come in over... and over... and over again. Give yourself the option of taking a quick, fast payday, or pushing towards the BIG payday - right off the bat! How to have your competition “feed you” the best deals, and generate $40k paydays without EVER swinging a hammer! If COACHING CLASS 1 wasn’t enough all by itself, Coaching class 2 will have you ready to action immediately. You’ll discover how to have other people *beating down your door* to fund your $40k flip deals... even though they let you keep the lion’s share of the profits. This is how I have funded almost every single one of my deals for the past five years, and you’ll quickly see why you need to do it, too. There’s a little-known secret in the real estate world... it’s a secret source of capital that almost no one knows about - and it’s sitting right under your nose. It’s sitting in IRA’s. In this earth-shattering class, you’ll discover how you may be sitting on top of the biggest source of private funding that you’ll ever need to do your $40k Flips. Don’t have an IRA? NO PROBLEM! You’ll see how self employed sales reps, business owners and “regular folks” absolutely NEED you to invest their retirement cash into your $40k Flips. MEET the President of America’s #1 Self Direct IRA Custodian and learn the insider secrets straight from the expert! If you aren’t drowning in cash after Classes 2 and 3, we’ll dump more capital on you in Class 4, where you’ll discover the *alternative* (that means “hush hush”) ways to get all the cash you need for your $40k Flips. Once we’re through this module together, you’ll never have to spend a single dime on a real estate deal, and you’ll be able to do as many as you want over... and over... and over again. Josh’s done-for-you “Private Lender Payout” Spreadsheet, so you never have any question about what to do next! Now that you’ve got all the cash you can handle, it’s time to put that money to work. You’ll discover EXACTLY how I can *consistently* acquire 2-4 homes PER MONTH without EVER spending a dime on marketing. How do I do this? Here’s a hint... I got my competition to bring me my best deals, so that I never have to find them myself. Can you imagine having deals constantly flooding your doorstep, ready for you to make $40k per flip? That’s EXACTLY what can happen when you do what I’m about to show you. AND how to pull the “no risk, no fail” parachute to opt out of a bad deal, so you’ll NEVER be stuck holding a deal that doesn’t make a ton of money! Did you know that the entire “time to profit” can be as short as three months? Yes, your first $40k Flip can come in just twelve weeks. I’d be willing to bet that that’s three times what you’ll make at your job in the same amount of time. In this class, we explain exactly how that is possible, and we’ll show you all the work that’s involved in the rehab process, so that you know how to meet expenses, never pay more than you should, and boost each project to its MAXIMUM payday. How to get in and out in 12 weeks or less regardless of the project size, and walk away with a check! How to get paid when you BUY and not have to wait to get all your money, so you get money RIGHT FROM THE START! For the first time EVER, we will spend time looking at your deals in this live class. Yes, we will actually work directly with you on your deals. HECK, we will even PARTNER WITH YOU on the deals that you’ve got if you’d like and split the profits. PLUS... in this class, you’ll discover how to make sure that all the work gets done on your $40k Flips without your direct involvement, so your deals are increasing in value even while you’re out on the golf course or playing with your kids. We’ll give you all the checklists to make sure that it all gets done. In Class 8, we reserve the time to go over *even more* of your deals and partner with *even more* of our students. Find the deal of the century? Bring it to the table, and we’ll partner on it. Or, if you’re ready to do it on your own, we’ll walk you through the process and hold your hand through the process until you get the check. How to do $40k Flips when you have no trade skills like JOSH. How to hire and outsource all the improvements with confidence. Our simple budgeting and scheduling worksheets that are plug and play. Have you ever been afraid of getting “stuck with a house” that you can’t sell? Well, fear no more! In this class, I’ll show you how we have sold houses in 90 MINUTES OR LESS! That’s right... through our proprietary Property Launch Formula, we regularly get our FULL asking price and close the deal in ONE DAY! We’ll reveal all the details of our Property Launch Formula inside of Class 9. Ready to collect your cash and get your $40k check? In this Class, you’ll be ready to put it into the bank. But first, we need to go over some simple details to put that payday into your pocket. You’ll also hear as we unpack some student case studies - people who started just like you - and are now putting $40k checks into their pocket. Will you be our next success story after you cash your big check? How to close silky smooth every time so everyone involved is smiling EVEN though they are making far less than you are. Mark your calendars NOW for each of these LIVE CLASSES – it is critical that you don't miss a single one! BONUS #1: Funding & Partnering with Josh for your best qualified big profit deals* I’ll personally partner with you on your BEST BIG PROFIT 40k Flips Deals and provide you with Deal Review, Partnering & Funding on qualified deals. Bring me your best big profit deals and lets make money together! Purchase + Rehab Up To 65-70% Of A.R.V. Buy, Rehab And Profit With Little Or None Of Your Own Money! BONUS #3: UNLIMITED EMAIL and PHONE ACCESS TO THE EXPERTS – During the LIVE classes, you will have unprecedented and unlimited access to Josh Cantwell, Mark Cantwell, Gary Elsmore (President of iPlan Group), Ralph Sherman Esq (Josh’s #1 attorney), Joe Dunson Esq, (Josh’s #2 attorney) Karen Danko (President of Emerald Glen Title who closes Josh’s deals), Roberdo Flanders (Josh’s financial Controller), Jason Schlegel (General Manager of Sharp Concepts Realty) and other $40k Flips experts as we personally answer all your emails, phone calls and questions. BONUS #4: “DONE FOR YOU $40K FLIPS PRIVATE CAPITAL POWERPOINT PRESENTATION” – Inside The $40k Flips Coaching Program, Josh reveals exactly how he gets millions of dollars of capital to fund his $40k flips. This cheap, flexible, no income, no asset, no credit check capital is the “workhorse” behind $40k flips. You’ll why it’s so easy to get the capital for $40k flips. 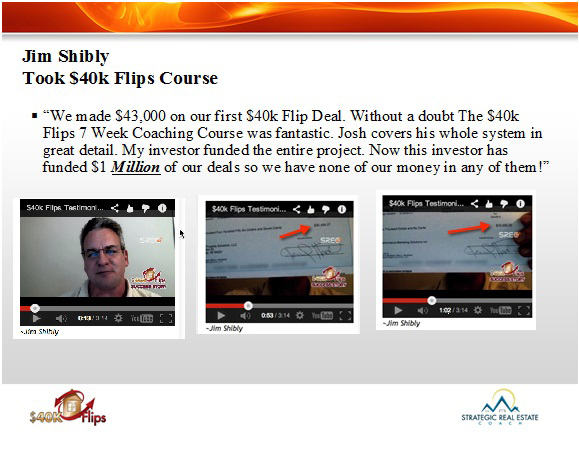 The $40k Flips powerpoint and the professional collateral is EXACTLY what Josh personally uses and it’s all done for you! BONUS #5: THE $40K FLIPS COACHING FORUM. We are using is a private coaching forum and access will not be shared with the general public. The $40k Flips Coaching Forum is for “insiders only”. You are automatically in the $40k Flips Coaching Forum upon your enrollment today. “Outsiders” will not have access to the private $40k Flips Coaching forum. We will close things out by showing you how to *track your cash* and what to do next. By this step in the process, you’ll have your first deal well on its way, and it’s time to start talking about WHERE that cash is going. We’ll dispel all the myths and answer all questions in Module 11. How the money flows through a 40k flip: From Private Investor... to You... to crews... and to your pocket! How to virtually guarantee your buyer closes every time on time. BONUS #10 – LIFETIME MEMBERSHIP TO $40k FLIPS MEMBERS ONLY SITE & RETAKE YOUR CLASSES AS OFTEN AS YOU LIKE FOR FREE" - In our members only website, we will give you 24/7 access to all the spreadsheets, systems, contracts, documents, paperwork, The Profit Predictor worksheet, the recorded coaching calls, and all of the PowerPoint presentations. I can’t wait to get started with this training and letting you in on this amazing strategy. If you have problems accessing the $40k Flips Members website or have any questions, do not hesitate to contact our office at support@srecnow.com or via phone at 1-877-811-3011. Here's to your success and I look forward to our first session. Get started now. You’ve never had this much access to real guys doing real deals like these. SPACE IS STRICTLY LIMITED TO 50 INVESTORS. We definitely don’t want all out competition to find out about this and use our ideas, so this page will only be up for a couple days. Plus, we only plan on taking 50 investors into the $40k Flips training class and 10 investors at our offices AND 12 spots have already been handed out to Josh’s “Insider Circle”. See below for details on how to enroll now. That’s it. When the spots are full you’ll be locked out. Better reserve your spot today before this closes down. Learn All The Secrets To Cashing $40,000 Checks Month after Month From Your Own Home. Learn Directly From Josh Cantwell And Mark Cantwell, Master Real Estate Investors. See Them Reveal The 27 Insider Secrets To Having An Evergreen “Never Changing” $40k Flipping System. On A Little Known Niche Of Bank and Government Foreclosed and Distressed Homes. The way I see it you have two options, you can set yourself on a path to financial freedom or you can disregard the remainder of this letter. Click the "Add to Cart Button Below and Enroll in $40k Flips. 15 Live Coaching classes to help you implement these dynamic strategies. Real Time Mastermind Forum So You Can Meet And Mastermind With Other $40k Flips Members. Click the "Add to Cart Button Below and Enroll in 40K Flips now. Want to Know The Best Part About All This? The Best Part Is, THIS NEVER CHANGES. The $40k flips system is NOT the latest fad or niche that will be out of favor in 12 months. The $40 flips System never changes. It was here 10 years ago, it's here today and it will be here in 20 years from now. How better can you think to completely secure your future? So you say this sounds great, but does it really work? Enroll in the $40k Flips 7 week coaching Program… AND if you are not 110% convinced $40k Flips will work for you we will give you your money back. Simply request your refund within 45 days of purchasing $40K Flips and we will refund your money. We believe that if you just enroll and get on the calls you will finally feel the sense of satisfaction and confidence you have been looking for. And if not, I don’t want your money. Click the add to cart button below and enroll before the 100 spots are taken. "DO A DEAL, Money Back Guarantee." So this is the big one…..Here we go….If at any time after you have taken the $40k Flips Course and Gone thru the 13 LIVE classes, closed a $40k FLIPS DEAL. Then just send me your video testimonial, a copy of your profit check, and HUD1 settlement statement and we will SEND YOU BACK YOUR ENTIRE ENROLLMENT FEE. Just send us the video and proof of your deal that we can use in our future marketing materials and we will send you your money back ANY TIME DURING YOUR LIFE. HOW's that for putting my money where my MOUTH IS. I'm so convinced you will love and enjoy the $40k Flip training and have results I'm willing to let you have the training for free after you close your first deal and tell us about it. As a quick side note, my $40k Flips Team and I have decided to donate 5% of all the proceeds of the $40k Flips Coaching Program to the Pancreatic Cancer Action Network. Pancreatic Cancer has just a 6% survival rate after 5 years. Since I am one of the lucky few survivors I feel compelled to donate money, raise awareness and try anything I can to fight this devastating disease. It’s the only thing I can do in order to help those who are not as lucky as I am.